In the heart of Malaysia’s coral triangle, just off the Coast of Mabul Island sits what used to be an oil rig, now painted in shades of sapphire blue and turquoise, and nearly blending into the blue-green Celebes Sea just ten meters below. Divers the world over have come to know and love it as the Seaventures Dive Rig, an actual dive resort and the only one of its kind on the planet. The project was the brain-child of Suzette Harris’ family. Today, Suzette still owns and operates the uniquely themed hotel and dive resort. After the rig – built in Panama and used by the Petronas Oil Corporation – was decommissioned and put up for sale in Singapore, Suzette’s family purchased it for use as a fishing platform and hotel in Labuan, a popular destination for sport fishing. When an opportunity opened up for the family to establish a resort on Mabul Island, however, they decided to use the platform there instead and had it towed all the way from Labuan, a treacherous journey of over 800 kilometres, or 500 nautical miles. The first challenge was converting the industrial oil platform to a comfortable hotel, with air conditioned guest rooms complete with adjoining restroom facilities and hot showers, and a central lounge open to refreshing sea breezes and spacious enough to accommodate occasional live entertainment. The next step was to hire dependable local staff of Divemasters, hosts and hostesses, and a top notch kitchen staff to create delicious, satisfying meals in a variety of styles, combining local cuisine with traditional Western fare. Perhaps the biggest challenge Suzette and her family faced was getting patrons to appreciate that a converted oil platform can be a really fun and unique place to stay, as well as an excellent venue for serious divers who want to make the absolute most of their dive vacation. A hydraulic lift carries guests straight down to the surface just 10 meters below where they can board a boat for one of the islands or just step right off to explore one of the most amazing house reefs in the area, designed by Seaventures’ very own Divemasters – talk about convenient! Also convenient is the close proximity to all three islands, Sipadan, Mabul and Kapalai, with a golden opportunity to obtain a permit for Sipadan Island available to those staying as few as three nights. All dive packages include unlimited house reef dives, so guests can explore the undersea playground to their hearts’ content in between trips to the islands, and even make night dives there and then hit the lounge afterwards for a round of drinks and a ration of dive stories. The open sides of the converted platform allow for a dazzling 360 degree view of the tropical isles and the sparkling Celebes Sea, and plenty of sunbathing on the sun deck for those who want to take home a bit of a suntan along with their vacation memories. Occasional live music, festive barbecues, satellite television and a DVD lounge provide plenty of other entertainment besides the night diving adventures. 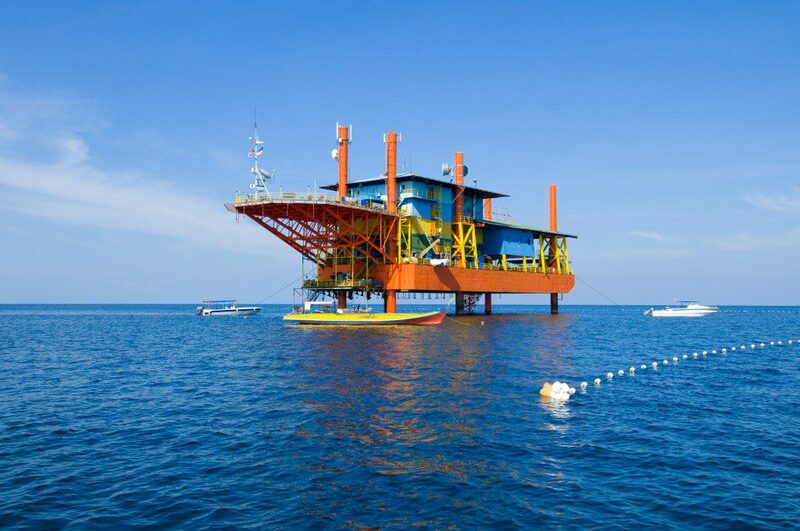 The many advantages of staying at the Seaventures resort include the convenience of a world class dive operation just steps from your hotel room, freedom from petty theft due to rig’s isolation and height above the water, and of course, the novelty of staying on an actual oil platform. Probably the best feature about the Seaventures Dive Rig, however, is the casual and friendly atmosphere, where serious divers and novices alike can get together and share experiences away from the non-diving tourist crowd. The Seaventures Dive Rig has been open and operating for 15 years now, with Suzette at the helm for the last five. 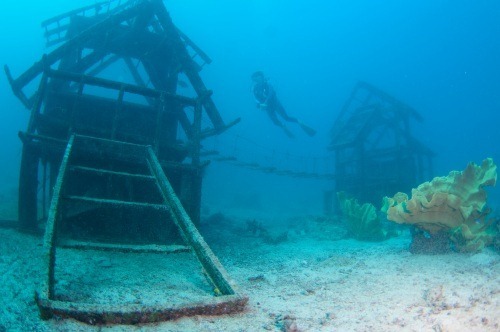 Since taking over Seaventures, Suzette has managed to grow the operation from a small, novelty dive hotel to a flourishing, popular resort, with divers coming in from all over the globe to experience the unique atmosphere and take advantage of the convenience and proximity to some of the best diving spots in the world. The staterooms may be small, but the service is big and the experience unforgettable. For anyone wanting to go on a real dive holiday, there’s nothing to compare with the Seaventures Dive Resort for the price, convenience, and just plain fun!